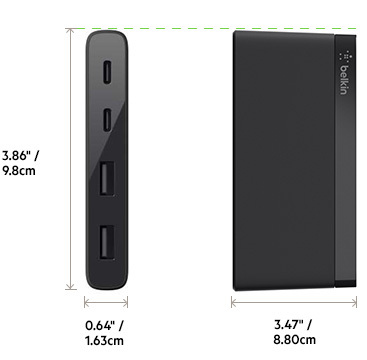 Rated 1 out of 5 by jhous3s from Will NOT Passthrough Charge Again, Belkin needs to address more clearly that this WILL NOT passthrough charging. Honestly, not really sure why that wasn't a thought it the engineers head when designing this product. 4 Ports to power and connect all my peripherals but no way to keep my MacBook Charged. Rated 1 out of 5 by grmon from Does break WIFI nearly completely Like for a few other users it shuts down my WIFI nearly completely. Theres still some traffic according to MenuMeters extension but this has no use when I am not able to use my WIFI with this plugged in. Belkin should fix this problem asap. Rated 1 out of 5 by Raymond52 from Failed out of the box Belkin has a very good reputation so this is odd. I plugged this into my new Macbook Pro and then tried to use my external monitor through the USB-C ports. Would not work. Monitor plugged directly into Mac works fine. Next it tried the USB 3.0 ports with a USB SD card reader. The reader lights came on but the card was not recognized. When I plug the reader in through a simple converter cable purchased at Walmart it works as expected. I purchased this hub through Amazon so I am returning it. Rated 1 out of 5 by jamescibie from Will not do what you need it for. Why was this product even created when it wont do what i EXPECTED it to: to charge the MacBook WHILE using wired mouse & headphones. To prospective buyers: this thing will NOT charge your MacBook. Poorly conceived product. Rated 1 out of 5 by Gtopp from The product dosen't work When I plug the multiport, my wi-fi close. I tried a couple of time in the two port available on my Macbook pro and the multiport always shutdown my wifi. I want Belkin to refund me. Rated 1 out of 5 by jbalp from Crashes my Computer This device works ok with USB storage devices, such as a flash drive. But whenever I plug my Logitech G402 Mouse, my computer crashes and restarts, if I leave the hub conected, it won't even boot into windows. Rated 1 out of 5 by vpb21 from useless Don't buy this stuff. Doesn't charge & doesn't work with SSD and usb drive simultaneously.